One of the most exciting new books of 2013 hits shelves today: Tenth of December by George Saunders. Also out are Will Self’s Booker shortlisted Umbrella, Rage Is Back by Adam Mansbach, Ways of Going Home by Alejandro Zambra, Scenes from Early Life by Philip Hensher, The River Swimmer: Novellas by Jim Harrison, Y by Marjorie Celona, Little Wolves by Thomas Maltman Love is a Canoe by Ben Schrank, Driver’s Education by Grant Ginder, and new from NYRB Classics is Testing the Current by William McPherson, with an introduction by D.T. Max. New in paperback are Gods Without Men by Hari Kunzru and The Lifeboat by Charlotte Rogan. There are many more new books to explore, of course, in our huge 2013 books preview, published this week. Hilary Mantel is the headline name on the 2012 Booker shortlist as she looks to repeat the stunning success of her first Thomas Cromwell book, Wolf Hall. Alison Moore and Jeet Thayil make the list with their first novels. The longlist was offered here with some excerpts a month ago, but since you might not have gotten around to them then, we’ll offer the same with the shortlist below. 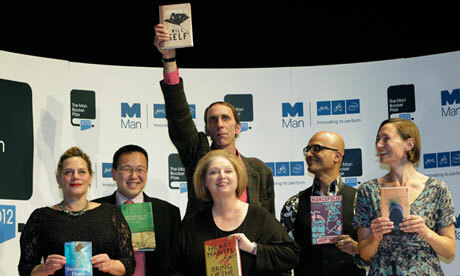 With the unveiling of the Booker Prize longlist, the 2012 literary Prize season is officially underway. As is usually the case, the list offers a mix of exciting new names, relative unknowns and beloved standbys. The lone past winner (for Wolf Hall, the prequel to her current longlister) is Hilary Mantel. At the other end of the experience spectrum, four debut novelists make the list: Rachel Joyce, Alison Moore, Jeet Thayil and Sam Thompson.